Community Life Hour (CLH) is not your grandpa’s chapel (not that there was anything wrong with that, but hey, times have changed). We call it CLH for a reason: it’s about bringing people together and building REAL community. 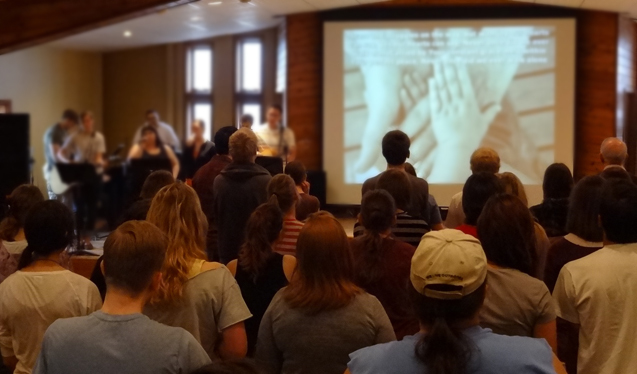 Sometimes that happens with extended time for worship in music or prayer, sometimes with a challenging biblical message from a guest speaker or from the faculty or student body. We also have faculty-, staff- and student-led small groups with topics ranging from Bible studies to board games, from the history of Christian rock-n-roll to hiking, from book clubs to baking lessons–whatever people feel like doing.